Pigs! 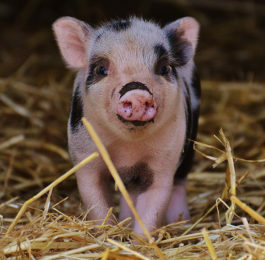 Those cute little porkers are beloved by many people: from farmers to homesteaders to pet owners. Plus there’s plenty of pig fans who don’t own a pig either. Whether you’re shopping for a pig owner or just someone who’s in hog heaven every time they see a piglet, they’ll love these creative, cute, and funny pig gift ideas. These gifts are perfect for Christmas, birthdays, and anniversaries. This is adorbs! 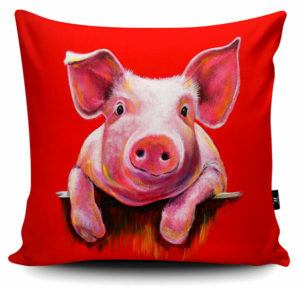 This vibrant accent pillow features a gorgeous pig illustration by Adam Barsby. Perfect to decorate a couch, chair, or bed, this red pillow cover is machine washable and printed with eco-friendly inks. Available as a cover only or with foam or feather filling. This is a cute and practical gift for pig lovers and owners. This is so cute! This set of salt and pepper shakers features two chic pigs that will match any decorating scheme. 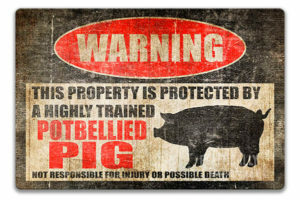 Perfect for display or use on a dining room table, any pig owner or fanatic will love this gift. This is one of the cutest pig gifts I’ve ever seen. 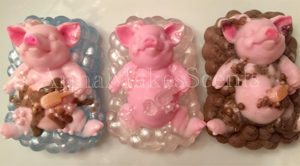 Anna Makes Scents crafts a variety of adorable soaps, including these bath time piggies. Made with goats milk, these pigs are perfect to display in a bathroom or even use. When you order you get a choice of a pig bathing in mud, blue water, or clear water. Pig owners can now be more like their favorite pet. This coffee mug features a pig snout on the bottom, so when you take a drink it looks like you have a pig nose. The side of the mug says “I’m…” and then the secret animal identity is revealed when they take a drink. This 12 oz. mug is perfect for coffee or tea. Made from porcelain, it’s dishwasher safe as well. Include some of their favorite coffee, tea, or hot chocolate to make an unforgettable gift. Feeling thirsty? This is such a unique gift that any pig fan will love. 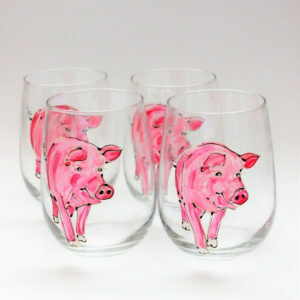 Audra Style Art custom paints these cute pigs when you order the glass. They’re available as traditional or stemless glasses or even a pilsner glass or coffee mug. Because they’re handpainted, each glass is completely unique. Get one or a whole set for your favorite pig owner. This piggie is the perfect gift for foodies or pig lovers who have a pig-themed kitchen. This pig-shaped cutting board is made from high-quality Moso bamboo–an eco-friendly alternative to wood. The surface is easy on knives as well as easy to clean–just wash in the sink or put it in the dishwasher. This sign is perfect for any kitchen. Lizton Sign Shop designed this cute, old-timey style metal sign. it says “Let’s Pig Out” with an illustration of a hog. 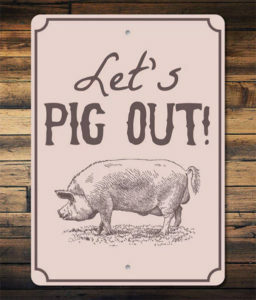 Printed on aluminum with a subtle pink background, it’s a cheeky gift idea for pig lovers. Good pig gifts are practical and fun, which is exactly what these socks are. Vibrant and comfortable, these socks from Socksmith feature a pattern of perfectly pink piggies. Great to wear around the house or out on the town–they also make a fabulous stocking stuffer (hah!). Jewelry is the perfect gift for Valentine’s Day, birthdays, and anniversaries. 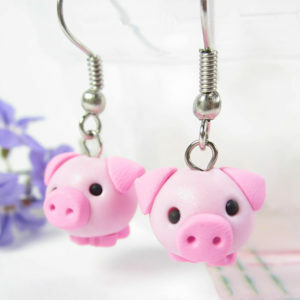 Luckily, if your lady loves piggies, you can eschew diamonds for these adorable earrings. Little Shop of Clays makes earrings from polymer clay. These handmade earrings are unique and the pigs have an adorable cartoonish appearance. Check out the pictures on Etsy: these little pigs have tiny feet and even a curly tail in the back. Adorable! The perfect accessory for cool weather, every pig lover needs a good pig scarf! Easy to dress up or dress down, this semi-sheer scarf features a piggy print. 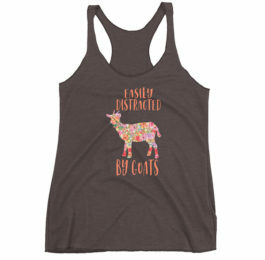 Available in gray, pink, or white. 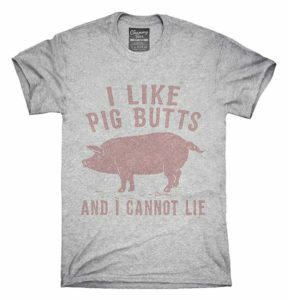 If you’re looking for funny pig gifts, this shirt is the one to get. The shirts are digitally printed when you order them, so they’re available in gray or white t-shirts, hoodies, or tanks. This necklace is the perfect pig gift for Mother’s Day, Valentine’s Day, or a special anniversary. Add some playfulness to a nursery or living room with this fun ottoman. Made from high-quality velvet and birch wood legs, this piggy is like your very own pet. It’s so cute, you’ll feel bad putting your feet on it! Available in three colors: brown, blue, and pink. The best pig gifts are fun and practical. For anyone who uses their computer all day, they know there’s never enough USB ports to plug into! This piggy solves that problem in the cutest way. Mama pig has three USB ports, including three baby piggy covers that plug in when a port is not in use. 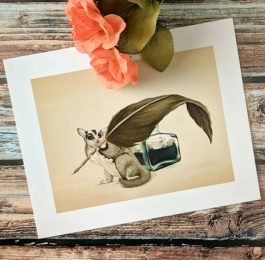 This makes an adorable addition to any desk. This is the perfect plushie for pig obsessed kids and adults who just need an extra little piggy in their life. This tiny pig is 8″ long and makes a lovely, floppy companion. Available in a clean design or distressed wood look, this sign is perfect to hang on a fence, barn, or even around the house. Nothing adds fun to relaxation time like a good pair of fuzzy slippers. This pink pair is perfect if you’re shopping for pig gifts. These slippers are more than just adorable piggies–they have 1″ thick foam padding that makes them some of the most comfortable slippers you’ll ever own. Sizes available for adults and kids, so the whole family can enjoy their own pig slippers. Perfect for Back to School, around the house, or to add a little fun to the office. This pack of gel pens features cute little pig heads on the end. Comes in a pack of 8, with non-toxic and acid-free ink that’s great for all ages. Makes a perfect stocking stuffer. Practical and fun, this zippered tote bag features a bright and colorful illustration of a pug. Versatile, this tote can be used for practically anything: laptop bag, diaper bag, grocery shopping, or travel. Fill it will other tiny pig gifts from this article to great a fun gift bag. Give the cozy warmth of a onesie with the playfulness of a pig. This cute pink onesie is the perfect pair of pajamas or works as a lazy Halloween costume. The hood adds extra warmth and looks like the face of a pig. Onesies are fun and practical pig gifts perfect to give at Christmas. Searching for more interesting and fun animal gifts?. Check out gift ideas for unicorns, pandas, and sloths.